The web is rife with rumour today. Firstly, Nokia’s N97 gets a UK release date, and then it’s believed Apple could have a 15-inch Macbook Pro on the cards, and now the latest rumour concerns the Palm Pre and Network ownership issues. 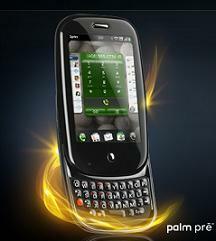 As well as being tipped for release in the vaguely described “first half” of 2009, the Palm Pre could be coming out of production and straight into the arms of Vodafone here in the UK. This is surely going to put a few faces out of joint – namely the ones vying for the touchscreen *cough* iPhone killer *cough* to be with them (every network bar O2). Word on the web is ‘Vodafone officials’ are claiming the Pre is Vodafone bound, but this cannot be confirmed and “nothing is solid” as Vodafone is “in early negotiations with Palm”. This means there won’t be an official announcement anytime soon, but could we hear more at Mobile world Congress? Is there going to be more than one carrier? Let’s wait and see shall we?